The Original Wheelgirl: My First Miranda Bag! Well it took me a while only because I haven't felt like going in the sewing room for some time, but I finally finished my first Miranda bag!! It is much more involved than the Gracie bag (also by Lazy Girl Designs) but is still a simple to make bag. I used fabric from Moda's Fall Back in Time line by Sandy Gervais. 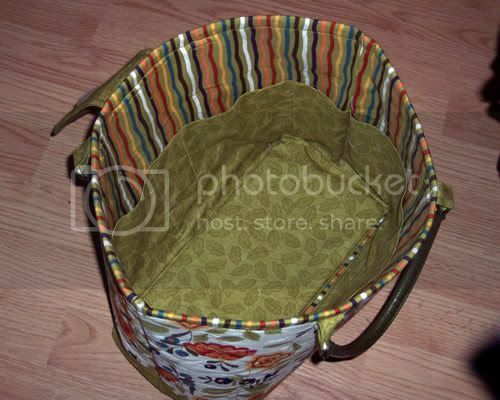 I love how the striped fabric I used for the inside of the bag forms the faux binding at the top. I used the dark green vinyl handles by Exclusively You by Leisure Arts, which are a bit darker than I would like, but I think it still looks good. Don't you just love all these cool pockets? So much organization in such a small package, although this bag turned out way larger than I expected. That is fine with me, the more room the better! 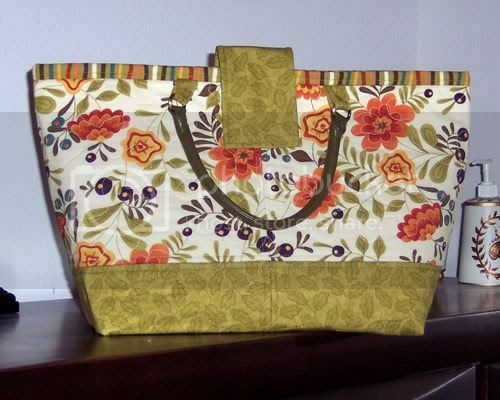 This bag is super sturdy, because it uses heavy interfacing (I used Decor Bond) on both the bag and the lining. It made for some difficult turning of the bag, but once that was done, it was cake. I love this design and will surely make another. But who knows when? I just have to find the time and pick out some new fabrics! There are so many new lines out now, and I am drooling over some of them!! Thanks for looking! Cindy, GREAT Miranda. I have the pattern but haven't had the time yet. I also love those fabrics. Just did a quilt top with them! You can see it here. Your Miranda is beautiful. Your fabrics are so cheery, rich and vibrant. I love the combination of floral and stripe. And your green handles look perfect. Your Miranda is AWESOME! I wouldn't have thought to use those fabrics for the bag. I was so in LOVE with that whole collection of fabric when it came out that I limited myself to a charm pack to make a table runner. Now I think I NEED to get somemore!! This is one of my favorite fabric combo's I've seen.. just gorgeous! So beautiful! Would you please explain what you meant by faux binding? Thanks. 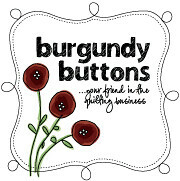 Faux binding means that the lining is cut a bit longer than the outside of the bag, is sewn right sides together to the outside, flipped to the inside, and the extra length shows up on the outside and looks like binding.